ONCHAN, Isle of Man – February 23, 2017 – Sports Jackpots by BetStars, a collaboration between StarsDraft fantasy sports and BetStars, both Amaya Inc. (NASDAQ: AYA; TSX: AYA) brands, has launched today on all .COM, .EU and .UK markets where BetStars is currently available. BetStars Sports Jackpots (http://www.betstarsjackpots.com) is the newest sports betting innovation from BetStars — a reimagined sports betting experience that combines the best of fantasy football with daily, real-money tournaments and life-changing $1 million jackpot prizes. 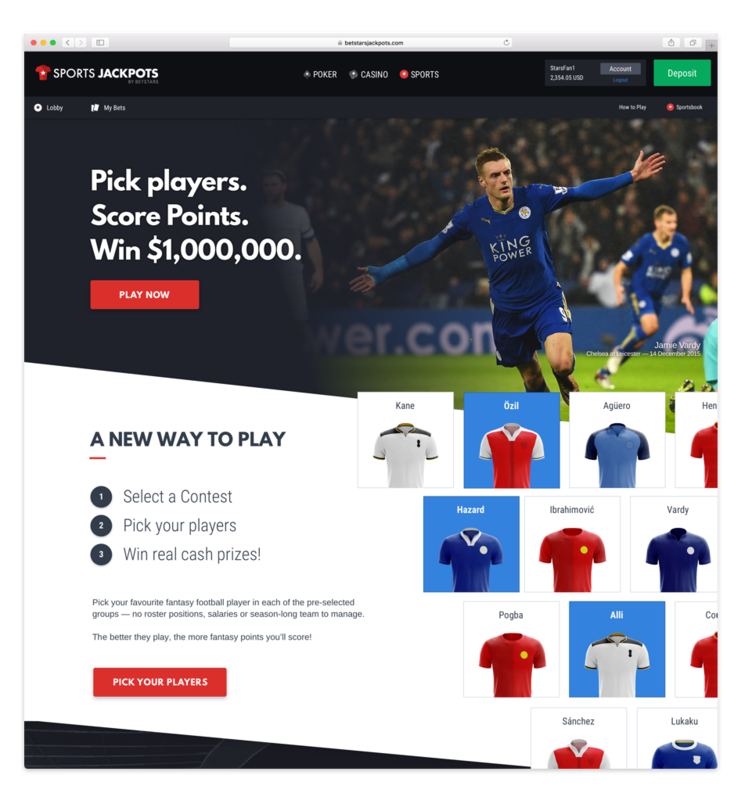 BetStars Sports Jackpots is a simplified version of traditional fantasy football that’s quick and easy to play. Players use their sports knowledge to beat the other tournament entrants by picking which football player in each of the pre-selected groups will score the most fantasy points that day — no positions, salaries, or season-long team to manage. For players who are not familiar with fantasy, or who are short on time, BetStars Sports Jackpots provides a smart pick tool that enables users to auto-select their players based on different criterion. To win a prize in a tournament, which typically pays the top 25% of participants, each fantasy point scored by a player’s selections is totalled and ranked against other users on a leaderboard. Just like in multi-table poker tournaments, the more participants that enter a tournament, the bigger the prize pool grows. Prizes are then paid out immediately following the last football match of that day. To win the $1 million jackpot prize, players must pick that day’s top scoring fantasy player in each of the pre-selected groups. Consolation jackpot prizes will be awarded for users that come close to picking all of the top scorers. “Football fans will be able to enjoy an added sweat by complementing sports book action with BetStars Sports Jackpots. It’s a fun, quick, and easy way to get the thrill of fantasy sports without having to commit to a whole season,” said Zeno Ossko, Managing Director, BetStars. Players who already play on PokerStars, PokerStars Casino, or BetStars can use their existing Stars Account to log in to BetStars Jackpots, and can play across poker, casino, sportsbook, and Jackpots with one centralized bankroll. BetStars is a new online sports betting brand from the Rational Group, which operates the world’s largest online poker room, PokerStars. The sports betting service features a wide range of popular and specialist betting options, fantastic promotions and exclusive new products. BetStars offers players a seamless experience between sports betting, casino and poker, with a single wallet between all three services. BetStars is available online and on mobile and tablet, with dedicated iOS and Android apps for a quick and simple betting experience. BetStars is ultimately owned by Amaya Inc. (Nasdaq: AYA; TSX: AYA).